The character of a stone floor differs vastly between different stones, especially when taking into account the manufactured finish, and the final finish achieved by means of sealant and maintenance products. Stone floor restoration per se, may not in all cases be desirable. Aged flagstone floors found within period properties for example, are often a priceless gem. The patina on the stone tile impossible to reproduce by artificial means other than through use and maintenance over a period of time. My perspective is always considered and understanding to client and stone floor alike. I welcome the opportunity to offer guidance and share my experience with regards to the sympathetic restoration of your stone flooring. Unsealed stone is porous and will look a right mess in no time, so make sure it is properly sealed and re-seal frequently (check the manufacturer’s recommendations). 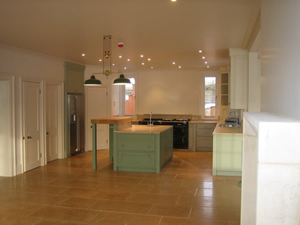 Traditional Flagstone floors in a kitchen, hallway or dining area look amazing, and can make a room stand out. Stone flooring lasts forever and needs very. Any enquiries about stone floor restoration are welcome, please contact for further details. Whatever your requirements from a traditional look to a contemporary feel, we will deliver your project to your specifications, so that you can enjoy your new space in confidence for years to come.